Salvador Dali Down the Rabbit Hole available as part of the book. 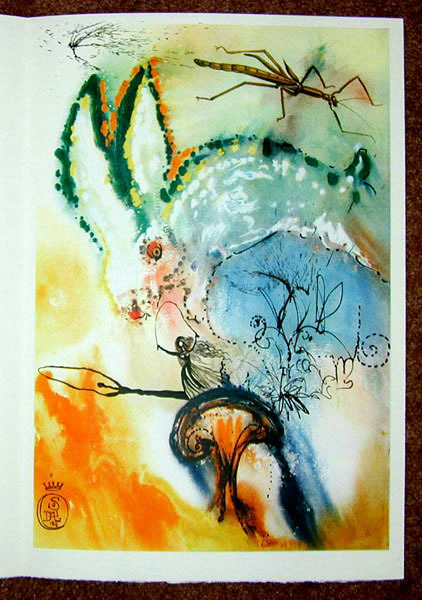 Salvador Dali Down the Rabbit Hole is from the Alice in Wonderland book. The book was released in 1969 by Random House. The books consists of twelve heliogravures and one etching. Down the Rabbit Hole is a chapter from the book. Each heliogravure, except for the frontispiece etching, is on the third page of a folded sheet with two pages of text. We are selling both complete books and individual heliogravures. Click on this link for additional background information about the Alice in Wonderland books we have in stock.